"50 year old female, back pain, #111"
I pulled up outside the house, grabbed my bags and a full PRF and headed in. On the car, we use mini-PRFs as we normally hand over to the crew. If we leave someone at home then a full size PRF is completed enabling you to go into further detail. This patient was not going to be going to hospital! A one week history of back pain in the middle of the night was not an emergency, nor did it need to waste the time of a busy A & E, a heaving walk in centre or a snowed under out of hours GP. I listened careful to every word about the back pain and followed up with a long list of probing questions. Sometimes it only requires a few, others it requires an very in depth history. This was somewhere in the middle. I assessed her pain, her mobility and decided she, as predicted, had non-traumatic back pain with no relation to the heart. I did an ECG, and all her observations. All were absolutely fine. She hadn't taken pain killers or anti-inflamatories so I gave her both and left her with advice for now and future. She was a perfectly nice woman, polite, offered me coffee and some food so I have no complaints. I declined all the offers, said goodnight and headed back into the darkness. I have ranted at length before about people not using the ambulance service appropriately. 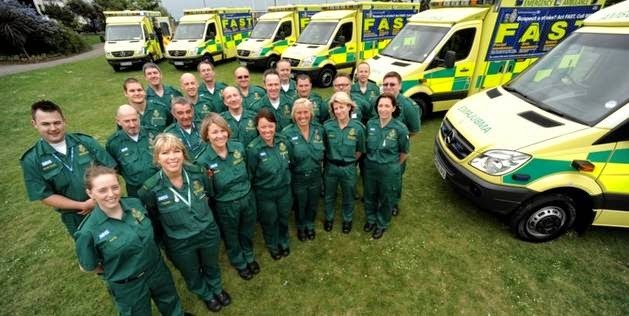 In fact, its not just about the use of the ambulance service, it's about the use of NHS services as a whole. Mis-use of GPs, A & E and NHS111 all lead to a strain being placed on an already stretched service, but why?! Why do people do this?! I refuse to believe it is just about education and that people didn't know what they were really doing when they called 999. They know exactly what they are doing! They know when the GP receptionist says 'is this an emergency?' the patients (myself included in the past) will say 'yes' invariably! Why? Because they will get an appointment. They also know if they mention discomfort in their chest when phoning 999, they will get an ambulance quicker. The fact is, the way patient uses the NHS is relative to their previous experience. If someone can never get a GP appointment, they'll lie to get one. If someone had to wait 4 hours for an ambulance, they'll lie to get one quicker. If someone had a bad experience at an A & E, they'll tell you they are under a different hospital to avoid going there. Previous experience will always mould future behaviour, it's basic human instinct. The problem is, like I have discussed before, experience is so varied depending on postcode and area, and will also be heavily swayed by the quality of staff who deals with you. For example, say I've not been feeling right for a few days. I would phone my GP, it's not an emergency so I'm offered an appointment in 10 days time. That's no help really but I take it. 10 days later I may or may not be feeling better and I go to my appointment. The GP decides I need bloods. He gives me a letter, I then I have to go to blood clinic which is miles away. Anyway, I go. I take a ticket, wait ages in line, get my bloods and go home. I'll never get those results unless something is wrong. That said, it could be an anxious wait. All in all, after a phone call, a 10 day wait, a trip to another hospital for bloods and then a week wait for the all clear I'm done. Alternatively, I could go to A & E, ham it up a little, get my bloods taken, wait 4 hours for the results and get discharged with piece of mind by a doctor. What's preferable to the patients?! This is why year on year ambulance services and hospitals are getting over run! Because between us we provide a one-stop-shop fix to most of our patients. People who are anxious about something want an ambulance to merely give them a check up. They say they can't get a GP appointment so we are the only option they see as viable. It's not the GPs fault either, they are over run with 1000s of people with the most minor or ailments who simply can't cope with a days pain or discomfort. We as a country are become less and less able to deal with illness! And why?! Because we have been nannied for too long! People can no longer cope with a cold or a chest infection. There is a huge expectation on what medical professionals can do and the magic wands that we carry. I think there are two things that have to happen. I think a move away from the traditional GP surgery and a greater use of GP led walk in centres and urgent care centres needs to continue to grow. Secondly, the NHS has to stop being so risk adverse and needs to say no to people. The second someone says they have had their back pain for 5 days you say no. No ambulance. No GP appointment. Go to your nearest Walk In Centre using your own means of travel, a bus or a taxi and wait to be seen. Don't do that until you've attempted treating it yourself with pain killers, anti-inflamatiries, heat packs and rest. The problem is, that conversation and history taking takes time. The government insist on the absurd 8 minute target so the ambulance service is forced to use a triage system that is scared of saying no quickly. The use of others take longer and that is time we don't have. The old adage of everyone needing to work together is a cliche, but true. GPs need to work with other areas of healthcare more closely, as do ambulance services and A & Es. The problem is, everyone has their own pressures and their own targets to meet and that is the priority to each trust. No one wants fines for failing. Therefore, just as with the patients, organisations behaviour is relevant to previous experience. If they have been fined in the past, they will do everything possible to avoid it in the future. If that means abusing another trust, department or organisation then so be it. We are all in this together, but we aren't working together to fix it.